Learn how to create these Embroidered Cards and how to properly insert the liner into a envelope. 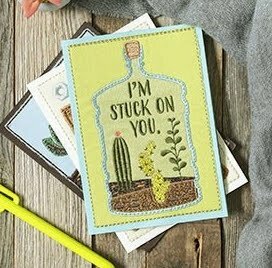 This class will show you different techniques that you can apply to various embroidered card designs. In this class we will be creating two cards with two two lined envelopes. Kits for this class are available for $4, please email shawnaa1sew@gmail.com to reserve one. What better sentiment than receiving a handwritten card in the mail? Take that kind gesture to the next level by sending your message stitched in style. We’ve crafted some special ways to say hello, happy birthday, congrats, thinking of you, and more with these cute and contemporary cards, but we didn’t stop there! Finish off your greeting with a printed envelope liner, each designed to perfectly coordinate with a themed card. Instruction only: Kits are available. Must own a Embroidery machine and have basic knowledge of how to operate it successfully. You must have purchased the design before attending class. The design is a separate purchase, you will receive 20% off for the class.